Background In pulmonary arterial hypertension (PAH) a prolonged time interval between pulmonary valve closure and tricuspid valve opening is found. This period is interpreted as prolonged right ventricular (RV) relaxation, and thus a reflection of diastolic dysfunction. This concept recently has been questioned, since it was shown that RV contraction continues after pulmonary valve closure causing a post-systolic contraction period. Objectives To investigate in PAH whether the increased RV post-systolic isovolumic period is caused by either an additional post-systolic contraction period, or an increased relaxation period (diastolic dysfunction). Methods 23 patients with PAH (mean pulmonary arterial pressure 54±12 mm Hg), and 18 healthy subjects were studied using cardiac MRI. In a RV two-chamber view, times of pulmonary valve closure (TPVC) and tricuspid valve opening (TTVO) were measured, defining the total post-systolic isovolumic period. Time to peak of RV free wall contraction (TpeakRV) was determined with myocardial tagging. Post-systolic contraction and relaxation periods were defined as the time intervals between TPVC and TpeakRV and between TpeakRV and TTVO, respectively. These periods were normalised to an RR interval. Results The total post-systolic isovolumic period was longer in patients than in healthy subjects (0.15±0.04 vs 0.04±0.02, p<0.001), but the relaxation period was not different (0.06±0.02 vs 0.05±0.02, p=0.09). The post-systolic contraction period in patients was strongly related to the total post-systolic isovolumic period (y=0.98x–0.05; r=0.89, p<0.001), and was associated with disease severity. Conclusion In PAH, the prolonged post-systolic isovolumic period is caused by an additional post-systolic contraction period, rather than by an increased relaxation period. 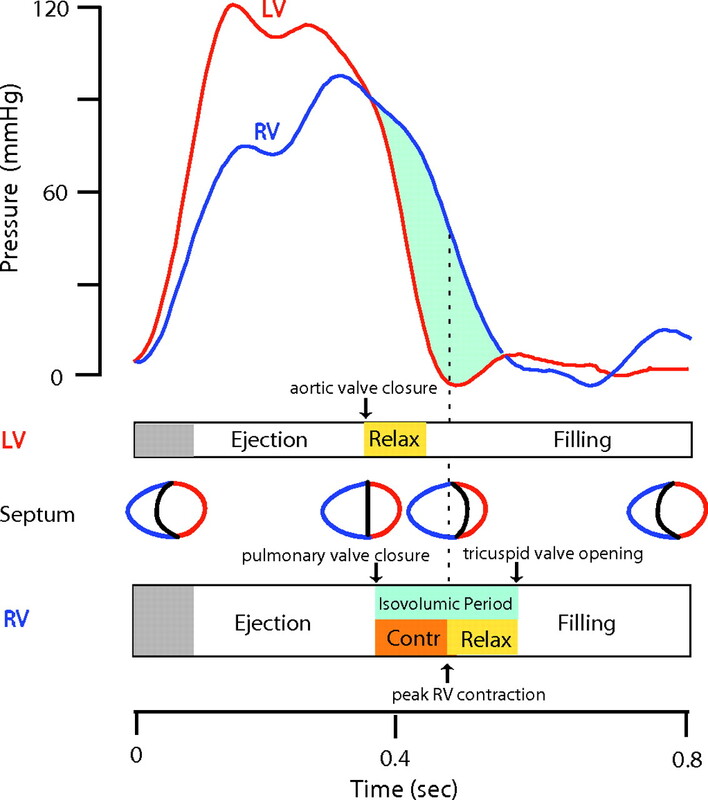 However, Marcus et al11 demonstrated that in PAH the shortening (contraction) of the RV free wall continues after pulmonary valve closure, as an indication of a post-systolic (or post-ejection) contraction (see figure 1). Post-systolic isovolumic period in pulmonary arterial hypertension. This period consists of a contraction period and a relaxation period. RV, right ventricular. Consequently, this raises the question whether the current interpretation of the increased post-systolic isovolumic period as prolonged RV relaxation (diastolic dysfunction) is valid in PAH. Alternatively, a post-systolic contraction period followed by a normal isovolumic relaxation period might explain this prolonged time interval. Therefore, the aim of this study was to explore in PAH whether the increased post-systolic isovolumic period is caused by either a post-systolic contraction, or an increased relaxation period (diastolic dysfunction), or both. To answer this question a group of patients with PAH of different disease severity were studied using cardiac MRI. This study was conducted within the Pulmonary Hypertension Program at the VU University Medical Center. The institutional review board approved the conduct of this study and all patients gave informed consent before enrolment. We recruited 23 consecutive patients referred for right heart catheterisation in the follow-up of their PAH. All patients also underwent cardiovascular magnetic resonance (CMR) imaging as part of their disease evaluation. A mean pulmonary artery pressure (PAP) of >25 mm Hg with a pulmonary capillary wedge pressure of <15 mm Hg was considered to be PAH.12 13 Patients with any form of cardiopulmonary disease and those who were unable to undergo CMR were excluded. Results were compared with 18 age- and gender-matched, non-smoking controls subjects, without a history of cardiopulmonary diseases. CMR imaging was performed on a 1.5T scanner (Magnetom Sonata, Siemens, Erlangen, Germany). Complementary tagged (CSPAMM) myocardial images with high temporal resolution (14 ms) were acquired in all patients using steady-state free precession (SSFP) imaging and a multiple brief expiration breath-hold scheme as described by Zwanenburg et al.14 Parameters were: three phase-encoding lines/beat, repetition time 4.7 ms, echo time 2.3 ms, no view sharing, flip angle 20°, voxel size 1.2×3.8×6.0 mm3. Images for two-dimensional strain analysis were acquired in the mid-ventricular short-axis planes. With these tagging cine images, contraction and relaxation within the myocardial wall can be assessed. In patients and control subjects SSFP cine imaging (without tagging) was performed with full coverage of the left ventricle and right ventricle (stack of short-axis slices) to assess ventricular volumes and ejection fraction (EF). In addition, to determine the moments of the tricuspid and pulmonary valve closures, a long-axis cine image in the RV two-chamber view was acquired. For this purpose, SSFP imaging with view sharing was used to obtain a temporal resolution of 15 ms in a single breath-hold. The times to pulmonary valve closure (TPVC) and tricuspid valve opening (TTVO) were assessed from RV two-chamber cine images. In three patients pulmonary valve timing was derived from the most basal short-axis cine that showed the valves during the last part of systole. The stack of short-axis cine images was used for the calculation of the LV and RV end-diastolic volumes and the RV end-systolic volume. Since stroke volume (SV) from RV volumes has limited accuracy,16 LV volumes were used to calculate SV. RVEF was calculated using RV end-diastolic volumes and LV SVs. The time to maximal leftward septal bowing was measured at the most basal short-axis cine slice that still showed the LV and RV myocardium through the cardiac cycle. In the patients this post-systolic isovolumic period was found to consist of a contraction period and a relaxation period (figure 1). The isovolumic contraction period was defined as the time interval between TPVC (end systole) and TpeakRV. The RV isovolumic relaxation period was defined as the time interval between TpeakRV and TTVO. To minimise the influence of the heart rate, all periods were normalised to the heart period, the R to R interval. Results are expressed as mean±SD. Statistical significance was set at a value of p<0.05. Comparisons between patients and control subjects were made with unpaired t-tests, without correction for multiple comparisons. The relations between the post-systolic contraction period versus the post-systolic isovolumic period and the post-systolic relaxation period versus the post-systolic isovolumic period were tested by linear regression. Linear correlations between the post-systolic contraction period and pulmonary vascular resistance (PVR), systolic PAP, stroke volume index and RVEF, were also calculated. There were no differences between the 23 patients with PAH and 18 controls with respect to age (PAH=43±14 years vs controls=38±9 years) and proportion of male to female subjects (PAH=6/17 vs controls=6/12, Fisher's exact test, p=0.8). Patients' characteristics and haemodynamic variables are presented in table 1. On the basis of the ECG morphology, three patients had an incomplete, and two patients a complete, right bundle branch block (RBBB). Seventeen patients were diagnosed as having idiopathic PAH, whereas six had chronic thromboembolic PAH. The majority of patients were in New York Heart Association functional class III. Haemodynamics yielded characteristics of RV pressure overload. MRI data of healthy controls and patients with PAH are shown in table 2. Figure 2 shows in a patient with PAH, RV two-chamber images at the time of pulmonary valve closure and at the time of tricuspid valve opening, a short-axis cine image at TpeakRV and the circumferential strain curves during the cardiac cycle for the LV and RV free walls. The contraction of the left and right ventricles starts simultaneously, but the right ventricle reaches its peak later than the left ventricle. As can be seen, RV contraction continues after TPVC (post-systolic contraction) and reaches its peak before TTVO, dividing the post-systolic isovolumic period into a contraction period and a relaxation period. The post-systolic isovolumic period divided by RR interval in the patients was longer than in the control subjects (0.15±0.04 vs 0.04 ±0.017, p<0.001). However, the time to pulmonary valve closure, divided by RR interval, was not earlier in the patients (table 2). MRI-derived circumferential strain, cine and tagged images of a patient with pulmonary arterial hypertension. Circumferential strain curves (top panel), during the cardiac cycle for the left ventricular (LV) and right ventricular (RV) free wall. Cardiac magnetic resonance images (bottom panels), showing the right ventricular two-chamber cine images at the time of pulmonary valve closure (left) and tricuspid valve opening (right), and the short axis-tagged image (middle) at the time of peak RV contraction. The RV strain curve proves that, after pulmonary valve closure (341 ms), the RV wall continues its active contraction, reaching its peak at 399 ms and thus giving a post-systolic contraction period of 58 ms. The isovolumic relaxation starts after RV peak contraction (399 ms) until tricuspid valve opening (431 ms) giving an isovolumic relaxation period of 32 ms. The R–R interval is 767 ms.
As shown in figure 3, in the patients with PAH a significant relation exists between the RR-normalised post-systolic contraction period and the post-systolic isovolumic period (r=0.89, y=0.98x–0.05 p=0.0001), but no significant relation is found for the relaxation period and the post-systolic isovolumic period (r=0.05, p=0.82). 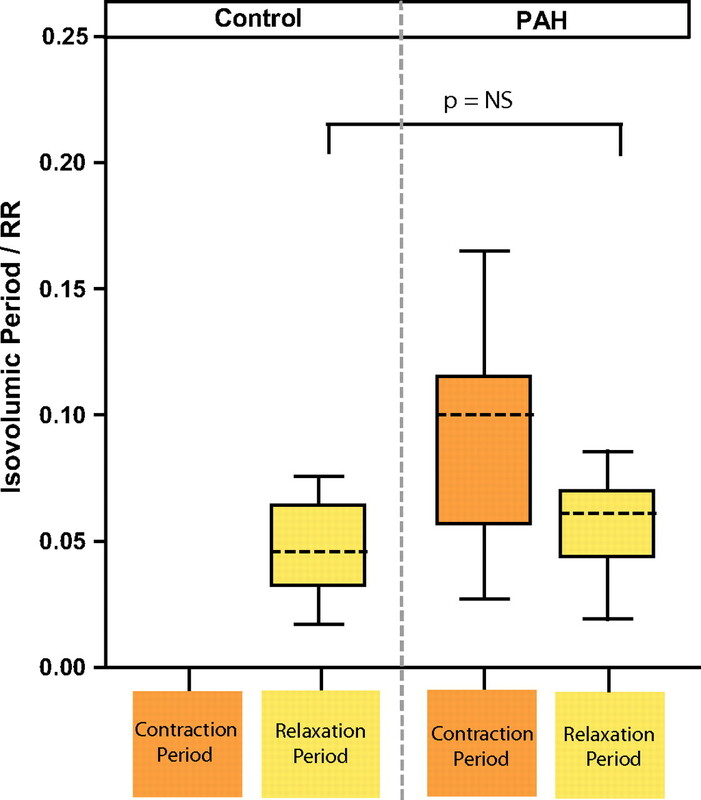 Additionally, in table 2 and figure 4, a comparison of the relaxation period between patients and healthy controls (0.057±0.018 and, 0.047±0.017, respectively) shows no significant difference (p=0.09). Prolonged contraction rather than prolonged relaxation. 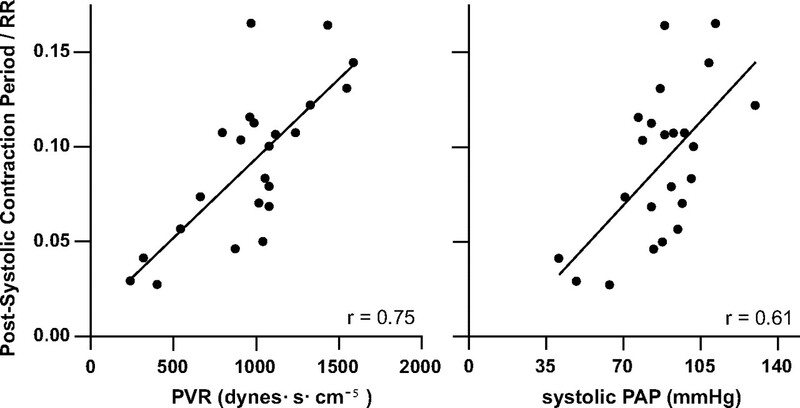 Correlation between the post-systolic contraction period and the post-systolic isovolumic period (A), p<0.001, r=0.89. No correlation exist between the relaxation period and the post-systolic isovolumic period (B), p=0.81, r=0.05. All periods are normalised for the R–R interval (RR). Results in two patients with pulmonary arterial hypertension with a complete right bundle branch block are highlighted (circles). Post-systolic isovolumic periods in patients with pulmonary arterial hypertension (PAH) and control subjects. The only difference between patients and controls is the post-systolic isovolumic contraction period, which is present in the patients but absent in the controls. No significant (NS) difference is shown in post-systolic isovolumic relaxation period between patients with PAH and control subjects (p=0.09). As shown in figure 5, there was an association between the post-systolic contraction period and PVR (p <0.001, r=0.75) and with systolic PAP (p=0.002, r=0.61). Furthermore, the post-systolic contraction period was negatively related to stroke volume index (r=−0.46, p=0.03) and RVEF (r=−0.58, p=0.003). None of these associations was found for the post-systolic relaxation period. Relationship between the post-systolic contraction period normalised for the RR interval as function of pulmonary vascular resistance (PVR, left panel; p=0.0001, r=0.75) and post-systolic contraction period normalised for the RR interval as function of systolic pulmonary artery pressure (PAP) right panel, p=0.002, r=0.61). The interobserver variation in the time to pulmonary valve closure was given by a correlation coefficient of 0.87 with p <0.001, and a bias of 9 ms with 95% confidence limits of agreement of −25 and 45 ms, respectively. For the time to tricuspid valve opening, interobserver variation was given by a correlation coefficient of 0.89 with p< 0.001, and a bias of 4 ms with 95% confidence limits of agreement of −37 and 44 ms, respectively. 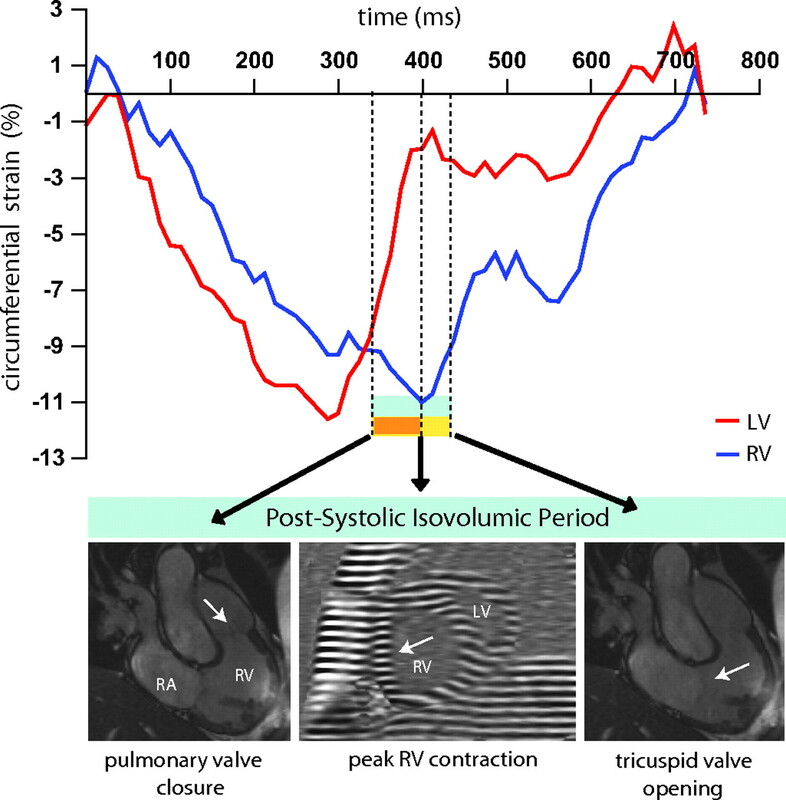 In this study the time of tricuspid valve opening was measured, which made it possible to analyse two separate time intervals in the RV post-systolic isovolumic period: (a) the post-systolic RV contraction time, between pulmonary valve closure and time to peak strain, and (b) the true isovolumic relaxation time, between time to peak strain and tricuspid valve opening. Thus, in PAH the RV post-systolic isovolumic period cannot be interpreted as a measure of RV diastolic function only, and thus should not be labelled as an isovolumic relaxation time. Second, the post-systolic RV contraction is associated with PAP and PVR. And finally, the true RV isovolumic relaxation time is not associated with PAP and PVR, and not prolonged. Therefore in patients with PAH the increased post-systolic isovolumic period results from prolonged RV contraction duration rather than slower relaxation. Figure 6 shows a pathophysiological concept, integrating our observations with previous findings in pulmonary hypertension. RV contraction starts simultaneously with LV contraction. Then follows the ejection period until pulmonary valve closure. After pulmonary valve closure (defined as end systole), RV contraction continues with a post-systolic contraction. This prolonged RV contraction, still continuing after the peak of LV contraction11 22 (see also figure 2) leads to a reversal of the trans-septal pressure gradient, which causes the post-systolic leftward bowing of the septum into the left ventricle and thereby impairs LV filling.20 23 24 Thus the post-systolic isovolumic period starts with an abnormal contraction period, during which the RV contraction energy is wasted in the non-functional septum bowing, which causes inefficiency in both RV systole and LV diastole.25 Only after peak RV contraction, which coincides with maximum leftward septum bowing, does a normal RV relaxation period begin. Integrated concept of the post-systolic isovolumic period in pulmonary arterial hypertension. For the right ventricle (RV), the post-systolic isovolumic period starts at pulmonary valve closure and ends at tricuspid valve opening. As shown in figure 2, this period starts with an RV contraction period, from pulmonary valve closure until peak RV contraction. This continued RV contraction is possible, without pressure increase, by the leftward septum bowing. At the peak of RV contraction, the right−left pressure difference is maximal and at the same time the septum bows maximally to the left. Subsequently, the isovolumic relaxation period begins. As mentioned above, the observed increase in the post-systolic isovolumic period is a reflection of increased RV contraction period. A prolongation of this period is a manifestation of the inefficient post-systolic RV contraction which is an important sign of RV pressure overload in PAH. This is in contrast with the current concept so far that this period is completely a relaxation period. This study therefore shows that in the right ventricle of patients with PAH, this prolonged isovolumic period is not a sign of diastolic dysfunction. How can we measure the RV post-systolic isovolumic period in daily practice, and thereby the effect of any treatment? It is the time interval between pulmonary valve closure and tricuspid valve opening, which can easily be measured by echocardiography.1 3–6 17 Therefore, measurement of this period provides an easy tool for monitoring individual patients during treatment. We acknowledge some limitations of our study. The temporal resolution of 15 ms limits the accuracy of the timing of valves and peak strain. Furthermore, the tagged myocardial cine images and the RV two-chamber cine images could not be acquired simultaneously. However, the acquisitions of both cine images were obtained within the same MRI session, with no discernible difference in cardiac conditions, such as heart rate. The lack of longitudinal and radial strain is a limitation. However, it is unlikely that these other strain components would have a different time to peak value. Finally, patients with and without targeted medication were included, but, nevertheless, a prolonged contraction was found for all patients . In PAH, the time interval between pulmonary valve closure and tricuspid valve opening (called post-systolic isovolumic period) is increased and consists of a contraction period and a relaxation period. The increase in post-systolic isovolumic period is only caused by increased RV contraction duration, and is not a reflection of diastolic dysfunction. The authors thank Professor Dirk-Jan Duncker, MD PhD, of the Department of Experimental Cardiology, Erasmus Medical Center, Rotterdam, for critical comments on the manuscript.
. Usefulness of right ventricular isovolumic relaxation time in predicting systolic pulmonary artery pressure. Eur J Echocardiogr 2008;9:547–54.
. Right ventricular diastolic dysfunction and the acute effects of sildenafil in pulmonary hypertension patients. Chest 2007;132:11–17.
. Right ventricular myocardial isovolumic relaxation time and pulmonary pressure. Clin Physiol Funct Imaging 2006;26:1–8.
. The evaluation of pulmonary hypertension using right ventricular myocardial isovolumic relaxation time. J Am Soc Echocardiogr 2005;18:1113–20.
. Right ventricular myocardial isovolumic relaxation time as novel method for evaluation of pulmonary hypertension: correlation with endothelin-1 levels. J Am Soc Echocardiogr 2007;20:462–9.
. Value of a Doppler-derived index combining systolic and diastolic time intervals in predicting outcome in primary pulmonary hypertension. Am J Cardiol 1998;81:1157–61.
. Doppler tissue imaging in assessment of pulmonary hypertension-induced right ventricle dysfunction. Am J Physiol Heart Circ Physiol 2005;289:H2450–5.
. The Tei index of myocardial performance: applications in cardiology. Hellenic J Cardiol 2005;46:52–8.
. Disturbed right ventricular diastolic function in patients with systemic sclerosis: a Doppler tissue imaging study. Chest 2005;128:755–63.
. Right ventricular diastolic dysfunction in heart failure. Circulation 1996;93:1509–14.
. Interventricular mechanical asynchrony in pulmonary arterial hypertension: left-to-right delay in peak shortening is related to right ventricular overload and left ventricular underfilling. J Am Coll Cardiol 2008;51:750–7.
. Task Force. Guidelines on diagnosis and treatment of pulmonary arterial hypertension. The Task Force on Diagnosis and Treatment of Pulmonary Arterial Hypertension of the European Society of Cardiology. Eur Heart J 2004;25:2243–78.
. Diagnosis and differential assessment of pulmonary arterial hypertension. J Am Coll Cardiol 2004;43(12 Suppl S):40S–7S.
. Timing of cardiac contraction in humans mapped by high-temporal-resolution MRI tagging: early onset and late peak of shortening in lateral wall. Am J Physiol Heart Circ Physiol 2004;286:H1872–80.
. Cardiac motion tracking using CINE harmonic phase (HARP) magnetic resonance imaging. Magn Reson Med 1999;42:1048–60.
. Non-invasive stroke volume assessment in patients with pulmonary arterial hypertension: left-sided data mandatory. J Cardiovasc Magn Reson 2008;10:51.
. Isovolumetric relaxation time of the right ventricle assessed by tissue Doppler imaging. Scand Cardiovasc J 2004;38:278–82.
. Determination of pressure in the pulmonary artery by external graphic recordings. Br Heart J 1967;29:396–404.
. Doppler echocardiographic index for assessment of global right ventricular function. J Am Soc Echocardiogr 1996;9:838–47.
. Left ventricular filling characteristics in pulmonary hypertension: a new mode of ventricular interaction. Br Heart J 1992;68:16–20.
. Right ventricular diastolic function in chronic obstructive lung disease. Eur Respir J 1992;5:438–43.
. Right ventricular dyssynchrony in patients with pulmonary hypertension is associated with disease severity and functional class. Cardiovasc Ultrasound 2005;3:23.
. Impaired left ventricular filling due to right-to-left ventricular interaction in patients with pulmonary arterial hypertension. Am J Physiol Heart Circ Physiol 2006;290:H1528–33.
. Interventricular mechanical asynchrony due to right ventricular pressure overload in pulmonary hypertension plays an important role in impaired left ventricular filling. Chest 2005;128(6 Suppl):628S–30S.
. Heart inefficiency in pulmonary hypertension: a double jeopardy. J Am Coll Cardiol 2008;51:758–9.
. Cardiac phase-dependent time normalization reduces load dependence of time-varying elastance. Am J Physiol Heart Circ Physiol 2009;296:H342–9.
. End-systolic pressure as a balance between opposing effects of ejection. Circ Res 1989;64:265–75.
. Transmural changes in size, contractile and electrical properties of SHR left ventricular myocytes during compensated hypertrophy. Cardiovasc Res 2004;63:283–92.
. Investigation of the mechanisms underlying the increased contraction of hypertrophied ventricular myocytes isolated from the spontaneously hypertensive rat. Cardiovasc Res 1993;27:1268–77.
. Sarcomere length control in striated muscle. Am J Physiol Heart Circ Physiol 1982;242:H411–20.
. Right ventricular pacing improves right heart function in experimental pulmonary arterial hypertension: a study in the isolated heart. Am J Physiol Heart Circ Physiol 2009;296:H1522–39.
. Right ventricular free wall pacing improves cardiac pump functioin severe pulmonary arterial hypertension: a computer simulation analysis. Am J Physiol Heart Circ Physiol 2009;297:H2196–205.
. Improvement in left ventricular filling properties after relief of right ventricle to pulmonary artery conduit obstruction: contribution of septal motion and interventricular mechanical delay. Eur Heart J 2009;30:2266–74. Funding Anton Vonk-Noordegraaf was supported by Netherlands Organisation for Scientific Research (NWO)-VIDI. Ethics approval This study was conducted with the approval of the the institutional review board.